I thoroughly enjoy the times when it’s possible to match the card to the birthday theme, yay! 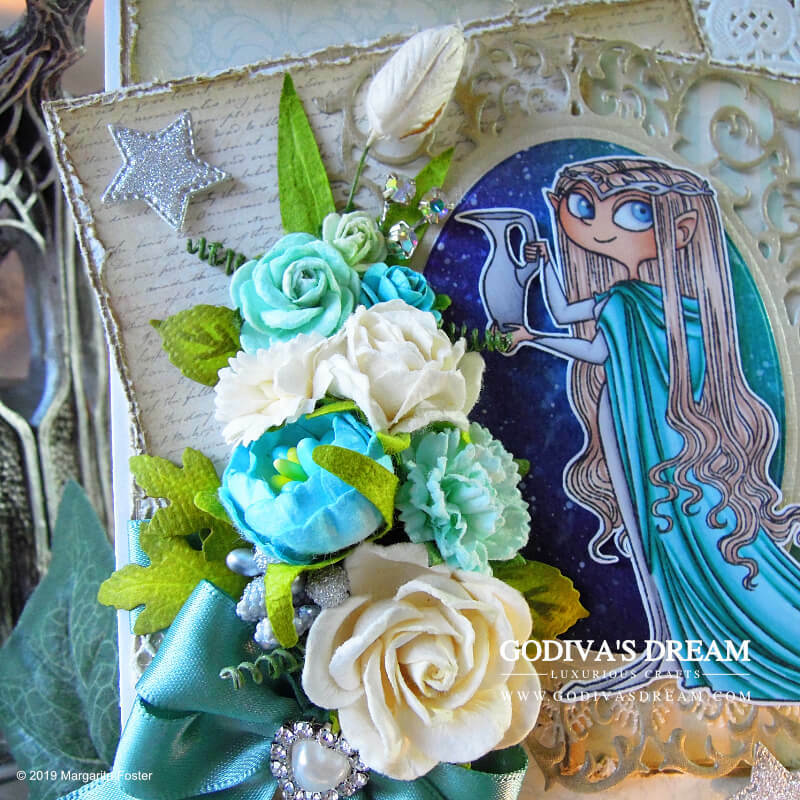 It is also no secret that I’m a huge fan of the “Lord of the Rings” films, so believe me when I say, I had so much fun creating this elven card! 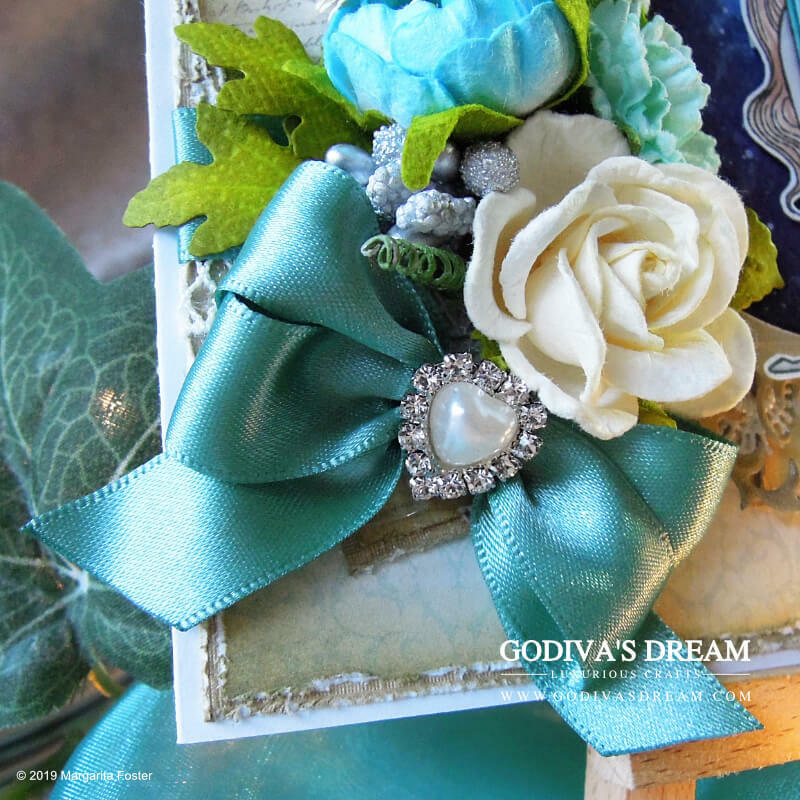 Those of you, who are familiar with the imagery of Lothlórien and Lady Galadriel, will know, that bluish and silvery colour tones are very prevalent - I definitely wanted to keep those on my card. Instead of pure blue, however, I chose turquoise as I find it a softer and more interesting shade. 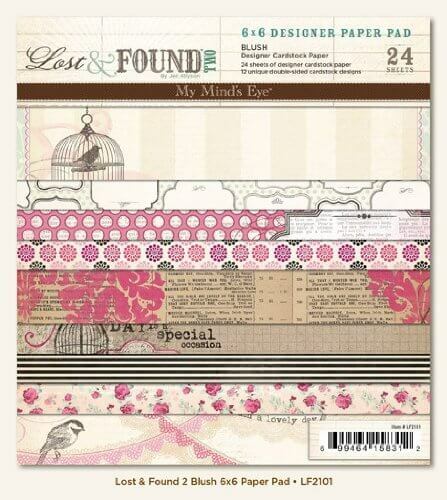 I found perfect understated patterns in the “Lost and Found: Blush” paper pad by My Mind’s Eye. This collection is predominantly pink, but I picked three papers in very pale, soft turquoise and ivory. Once I decided on the layout I intended to use, I cut the papers to size needed, inked their edges with “Frayed Burlap” Distress Ink and frayed them using a distressing tool (scissors work just as well). I also inked and distressed the pearlescent cream cardstock by Craft Sensations that I was going to use for matting. I added some pure white guipure lace and gorgeous light jade satin ribbon for extra elegance and opulence. In-between the layers, I also adhered a small doily, I felt that it complemented the look and feel of the project perfectly. The star of this project is none other than the Lady of the Light herself. 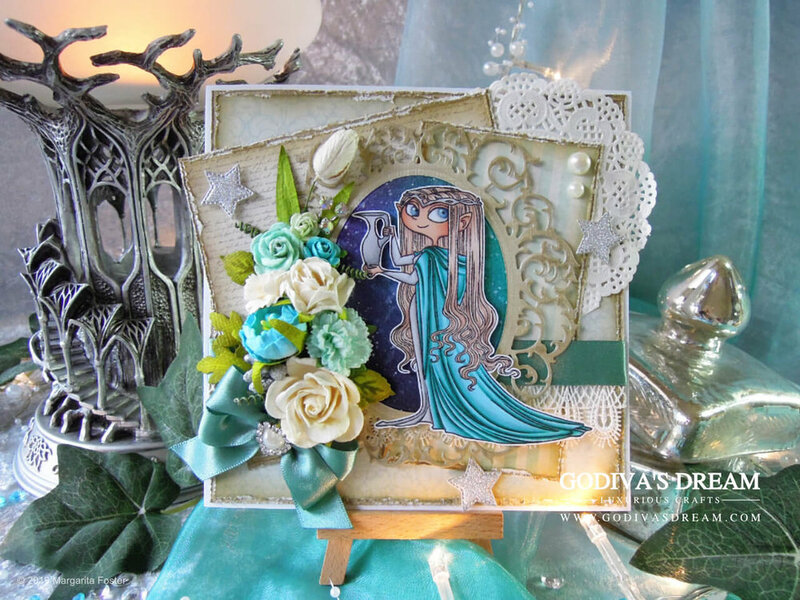 This beautiful “Galadriel” stamp is by the artist Annie Rodrigue for Kraftin’ Kimmie Stamps. I’ve been itching to use it since the day I bought it and that day was quite a few years ago! Cue excitement! I stamped the image in Memento “Black Tuxedo” ink and coloured it using Promarker, and Brushmarker alcohol based markers. I used the shades complementing the papers and the concept of the project. I then fussy cut the stamp leaving a narrow white outline around it to help the image pop against the background. The movie scene where Galadriel holds a silver jug happens at night, so the background idea for my card was pretty clear - it had to represent the night sky. I blended Tim Holtz “Distress Inks” in shades of Dusty Concord, Peacock Feathers and Tumbled Glass on watercolour paper. I then spritzed inked area with water to help those inks blend together even more and create interesting patterns. Finally, I sprinkled diluted white acrylic paint to create dots of various sizes and, thus, achieve the illusion of a starry night. To display this ethereal elven queen stamp, I wanted to use a frame which would be intricate and representative of Lothlórien forest, so I chose Oval Vine (6002/0304) die set by Joy! Crafts. I die cut the same pearlescent ivory cardstock I used for matting the patterned papers, and inked the edges of the frame with “Frayed Burlap” Distress Ink. I then die cut a plain oval out of the starry night background I prepared earlier, and glued it in the centre of the Oval Vine frame. I mounted the fussy cut stamp on 3D foam and positioned it in the middle of the decorative frame. Finally, I attached the whole focal piece to the card with the help of the same dimensional foam. In order to achieve as much elegance and luxury as possible, I just had to add some floral touches to this card. I chose a variety of mulberry flowers in different sizes and shades complementing the project. I also added some silver stamens and a crystal spray for extra interest. I tied my favourite double-looped bow out of light jade satin ribbon I used earlier, and adhered it at the bottom of the floral arrangement. I also attached a pearl and rhinestone heart flatback to the the centre of the bow. The devil’s in the detail, right? In order to fully finish this project, I added a couple of pearl flatbacks and die cut some stitched star shapes out of shimmery silver cardstock. I adhered them to the card using 3D foam, so they really pop. Et voila! If you liked this project or have any questions, please, leave a comment, I love reading them! Also, don’t forget that you can pin this article to your Pinterest board(s) and/or share it on social media using the buttons below. Thank you for reading and see you soon!